What is Study Abroad at UC? Study Abroad is for students who wish to study at UC for one or more semesters as part of an overseas degree. See how our Study Abroad and Exchange students have experienced New Zealand with their own photos and videos in our gallery. You can also explore our Facebook page for helpful links, photos, and updates from other study abroad students. Congratulations to Matthew Oglesby from the University of Alabama, one of the winners of the Photo and Video Contest! Check out Matthew’s winning video of his Study Abroad adventures below. While studying at UC you have the option to gain valuable real world experience and transferable skills through internships, field study, service learning, community engagement and more. Choose from a range of experiential learning opportunities to experience a Kiwi semester to the full. 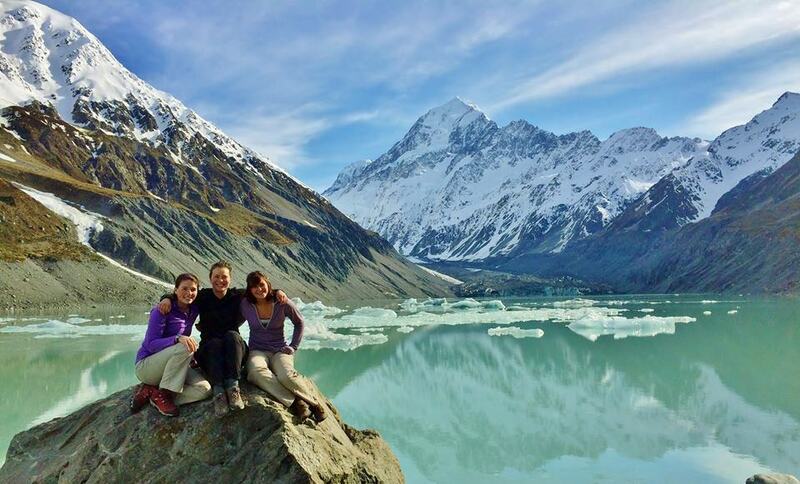 A number of UC International Mobility Inbound Study Abroad Awards are available to Study Abroad students who are enrolled in a full-time degree programme at a recognised institution outside of New Zealand, and who want to study at the University of Canterbury for one or two semesters under UC’s Study Abroad programme. Awards are usually worth $2,000 NZD, although some awards may be for lesser denomination. To ensure you are considered for the Award, please email a brief statement outlining why the Award will be useful to you to Anna Foster at anna.foster@canterbury.ac.nz by 15 November for Semester 1 (February semester) or 15 April for Semester 2 (July semester). Students must be full fee paying Study Abroad (non-degree) students enrolling at UC in the Study Abroad Programme. New Zealand and Australian citizens or permanent residents are not eligible for the Awards. UC is also offering an exciting Global Rugby Abroad programme to College rugby enthusiasts with an opportunity for a rugby Study Abroad semester in Christchurch. See more details about the programme on the webpage for the UC Global Rugby Abroad programme. Fill out our Study Abroad Application Form‌. Applications for admission after these dates will be processed, but please make sure that you allow time for all the necessary travel preparations, including applying for and receiving a student visa before you travel. There is a separate online application for accommodation. The academic year in New Zealand is usually the reverse of the northern hemisphere year. The US or European first semester will normally be the dates of Semester Two at Canterbury, and the US or European second semester will be the dates of Semester One at UC. Our long summer recess runs November to February. International students may apply to enrol as a Study Abroad student for one or more semesters. Study Abroad students are required to pay a set tuition fee at UC. If you are a postgraduate student, you will need to provide evidence of your completed undergraduate degree. Please see postgraduate students for more information. If English is not your first language, you must also meet UC’s English language requirements. For students coming from Germany for a one or two semester Study Abroad programme, we will also accept a DAAD English test score which meets UC requirements. Email us if you’re unsure that you meet the requirements set out above, or for any further details. Browse Qualifications and courses or Subjects to explore your study options at UC. UC offers a Certificate of Proficiency for courses completed which can be taken back to your university as a component of your degree. Although there is seldom any problem, it is important for you to check that the courses you propose to take are acceptable for credit in your home university. Some UC courses run for the first semester only, some for the second semester, and others which are full year courses. You will need to check when applying that the courses you want to take are available for the semester you want to be here. A standard workload is 60 points per semester and individual courses are worth either 15 or 30 points. Study Abroad students can select courses from across UC’s wide study options and are accepted provided the entry requirements for each course are met. There are some courses which may not be available to Study Abroad students. These include Fine Arts/Studio Art courses (Graphic Design, Film, Painting, Photography, Printmaking, Sculpture), some teacher education courses, 200 level LAWS courses, distance courses and some clinical practice courses. Some Physical Education and Sport Coaching courses may require police checks. Please contact us at ucmobility@canterbury.ac.nz to check if the Physical Education and Sport Coaching courses you wish to take require police checks. If you need to know in advance whether you are able to take a particular course, please include a course list in your Study Abroad application. If you are a postgraduate student you must provide a complete list of courses you want to study. Students wishing to study Civil and Natural Resource Engineering should provide a list of intended courses with their application. If you are applying to other engineering courses it is also recommended that you provide a list of courses with your application. As a Study Abroad student, you are required to pay tuition fees to the University of Canterbury. Tuition fees for postgraduate courses are calculated on a course-by-course basis. Tuition fees for a Study Abroad programme containing postgraduate courses may therefore be higher than the undergraduate flat fee. There are also additional costs to factor into your budget per semester. In 2019, the Student services levy is $413.50 NZD per semester. Insurance which meets UC requirements - $310 NZD per semester in 2019 for Studentsafe - student insurance (costs vary depending on selected provider). All students are required to have medical and travel insurance which meets UC requirements. Living costs may vary but you should budget for approximately $7,500 NZD per semester. Most Study Abroad students stay at Ilam Apartments on campus, which offers an accommodation package for Study Abroad students. Find out more about our accommodation package for study abroad students. As a Study Abroad student, you must apply for and receive a student visa prior to arriving in New Zealand, even if your country of citizenship has a visa waiver agreement with New Zealand. Find out more about visas and immigration. As a Study Abroad student it is compulsory to have medical and travel insurance, and your insurance must be valid for the duration of your stay. Please check the insurance requirements. You may either make applications directly to UC or through a Study Abroad programme based in your home country. Download and complete the ‌Study Abroad Application Form. Evidence of your English language proficiency if English is not your first language. If you are from Sweden, Norway, Germany or Denmark with a pass at a specified level in your final year of high school study you may be exempted from a language test. When the International Relationships Office has received your application, UC will send you an email to confirm this. UC will then process your application and normally notify you within 2 weeks of the decision. If you have been accepted, you will receive an email copy of your offer of a place, along with information on accommodation for international students, insurance for incoming students, orientation and enrolment. It is also an option to apply through one of the organisations below. UC has been working with the partners listed below for many years and welcomes all students that apply through their programmes. Whether you apply directly or through one of the following partners, you will still be considered for UC's International Mobility Inbound Study Abroad Award. Incoming Exchange student Harry Whan from the University of Nottingham, from saying goodbye to Mum at the airport to making new friends at UC and exploring the South Island, Harry has chronicled his time at UC in a series of photos, below. Check out his photo story here!